Tag line: "How Fast Can You Swim?" 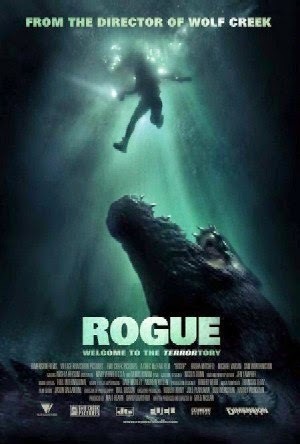 Rogue, a 2007 film directed by Greg McLean, has a lot in common with Black Water, another horror flick released the very same year. Aside from sharing the same basic premise (a group of people find themselves at the mercy of a killer crocodile), both are set in Australia, and shot (at least in part) in the continent’s Northern Territory. Admittedly, there are some differences between the two (Black Water features only three characters, two of whom are related, while Rogue centers on a group of strangers on a sightseeing tour), but in the end, both are tense as hell, and keep us on pins and needles throughout. American reporter Pete McKell (Michael Vartan) is doing research for an upcoming article on Australia. Having just arrived in the Northern Territory, he buys a ticket for a boat tour of the area, one that promises to take him deep into crocodile territory. Piloted by Kate Ryan (Radha Mitchell), the boat, loaded with passengers, makes its way down the river, but just as the trip is about to end, one of the group (played by Robert Taylor) spots a distress flare. Obligated to check it out, Kate guides the vessel into unchartered waters, where it’s rammed and nearly destroyed by an enormous crocodile! Forced to abandon the boat, Kate, Pete and the others make their way to a small patch of land, only to discover that the tide is coming in, which means soon after the sun goes down, they’ll be completely underwater. And with a pissed-off croc lurking somewhere nearby, getting to dry land isn’t going to be easy. One of the things that immediately struck me about Rogue was how gorgeous the movie is; from start to finish, director McLean manages to capture the natural beauty of Australia’s Northern Territory, presenting images so picturesque that they could have been lifted straight out of a BBC Earth documentary (the aerial shots are particularly stunning). What’s more, Rogue features an all-star cast. Aside from Vartan and Mitchell, both of whom are excellent, there’s Sam Worthington as the somewhat arrogant local, Neil, who, when the chips are down, comes up with a plan to save them all; and John Jarrett (Mick Taylor in Wolf Creek) as one of the passengers trying his best to cope with a terrible situation. As for the crocodile, it remains off-screen for most of the film (the first two attacks happen so quickly that we never see the creature), but when we finally catch a glimpse of it, we realize how humongous - and very intimidating - this animal is (it rivals the croc in 1999’s Lake Placid). Despite their similarities in story and setting, both Rogue and Black Water offer audiences a unique viewing experience. In fact, I'd go so far as to say they’d make an awesome double feature. Looks like an interesting film. However, I can't sit through the trailer because of that horrible jump-cut crap that's all the rage, these days. I hope they didn't use that format in the film!